Oil Spill Shell Sketch for Ripple – Let's Paint Nature! Do you feel helpless when you watch the news and see the continuing oil spill for the millionth day and think that you can do nothing about it? Well you can do something! Ripple is a site dedicated to raise money for the injured wildlife by selling artwork. You do not need to be a professional artist to contribute, see site for details. 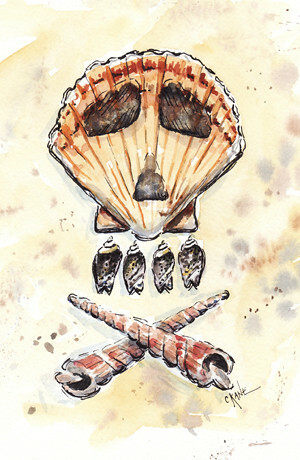 This painting, “Oil Spill Shells”, is my interpretation of the devastation endured by all forms of wildlife in the Gulf. It is poison. Even though I do not live near the oil disaster, I hope I can still make a difference. I’d thought about doing something like this, but administering it would be a nightmare. It still hurts me so badly, too. The more I see, hear & learn about it, the more the knife twists in my heart. I think I’m hiding in denial for the sake of my own sanity, truth be told.